The list includes Ad-based content sites, Online retail, Amazon affiliates and others. This is very impressive work for just 10 weeks of class time. Our Digital Business minor supports students in learning about how new technologies like those deployed in this class are transforming traditional business practice! Next up: the Digital Entrepreneurship class with students from around RIT’s campus. Last night’s team formation yielded 10 project teams creating business plans for new ideas that leverage these new technologies. Stop in at: http://digent.rit.edu to learn more. I am honored to have been selected to attend the National Science Foundation’s Future Internet Summit. As I browse the list of attendees, I see lots of brilliant computer scientists and networking specialists, a few industry folks, and some economists and myself (in Business) rounding out the list. This promises to be a fascinating experience interacting with some very bright people. KnowInnovation will facilitate our interactions. I’ll let you know more as the week unfolds. These technophobes are right about so many things. The technium is the phenomenon that is centrally determining all of Western history. It is outgrowing our capacity of understanding. It is advancing faster and faster without end. It is proceeding on an autonomous course. It is an end in itself. It is a kind of fate. This is scary. We have birthed a child more powerful than us, rocketing off to remake our essential nature, yet it zooms beyond our capacity to understand or control, accelerating in power, yet biased in its direction. No wonder the autonomy of the technium provokes such genuine concern. Yet the very same innate forces of extropy and self-organization that nurture the technological imperative, also are responsible for real progress. We have birthed a child more powerful than us, rocketing the advance of diversity and intelligence, it multiples on its own, yet it is headed in the direction we’d all like to go — more options, choices, possibilities and free-will. As expected, I learned a lot on my recent trip to the AMCIS conference in San Francisco. One striking thing is the incredibly high quality of new Ph.D.s in MIS. I met so many talented people, and interviewed as many as I could for our faculty position at RIT (http://bitly.com/ritmis). While advantageous for RIT, the true shame is that there are not enough faculty jobs for these talented people- not by a long shot. The fact that there are so few positions creates a dangerous situation where a whole generation of educators/researchers could be lost (thanks SWH for this idea). At this moment, there is not a lot that we can do about it. However, longer term there is one obvious thing to do-increase the enrollments in MIS. I believe there are two paths to that: better communication about the discipline, and recentering the discipline on the knowledge areas of its faculty. 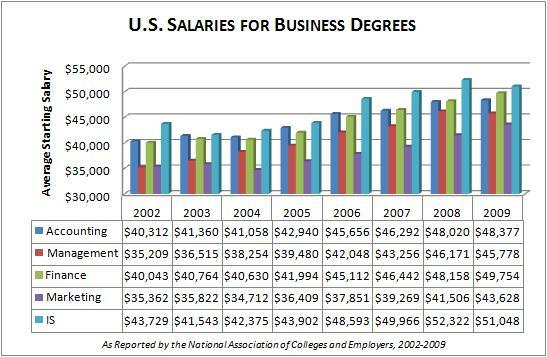 As an example of communication, the chart above (thanks Chuck Wood) shows clearly that MIS starting salaries have been the highest in the business schools for some time. Employers REALLY want the combination of technology and business and are willing to pay for it. MIS people end up doing a wide variety of things in organizations, but their tech/business/communications skills make them the key players in a lot of what happens. My friend Richard DeMartino comments how well MIS students do in entrepreneurial teams, and I am proud of what this group accomplishes. A second important approach to reviving the discipline is to find ways to capture the intellectual curiosity and new knowledge developed by its faculty. While for some researchers this is already happening, for many of us the curriculum is a standard that is far away from our interests. At AMCIS, I learned that MANY people are researching things that will never be taught in the standard curriculum. I feel that this is a shame, and possibly a detriment to the discipline. The MIS discipline has room for lots of different subjects in its conferences. We should find the way to bring them back to our students, because that natural energy that comes from doing what you like does not have a substitute. I am very interested in where this discipline that took me in has come since last I checked in. I will also be recruiting for the Saunders MIS group, which is one of a variety of disciplines in the College that fit together nicely. Can’t wait to see how it all comes together! Day 1 with the Samsung N110 has been relatively great. I knew that a netbook would likely be a great solution for me-since I am constantly moving between meetings and locations. My initial research suggested that this one would be a decent choice, and some Saunders students have already demonstrated Samsung netbooks to me. I am equally or more impressed with Ubuntu Netbook Remix, an OS made expecially for netobooks out of the latest Linux distribution. What’s great about this OS is that it is always current. Ubuntu is released continously, and it updates in a really simple manner. I am equally or more impressed with Ubuntu Netbook Remix, an OS made especially for netbooks out of the latest Linux distribution. What’s great about this OS is that it is always current. Ubuntu is released continously, and it updates in a really simple manner. The trend toward simple interfaces is strong now, with some Google Android OS (that for phones!) netbooks now available. Given the huge number of developers, the fast boot time, the ease of use. I have to believe that this is one of the best combinations of hardware and software currently available. I wanted to document my decision, because I made it with a lot of research and care. As you may know, I am very interested in mobile computing, both for my personal use and as a research topic. I was an early adopter of smartphone technology, signing up for the $400 Palm Treo 600 WAY back in the day (November 2003) on Sprint. After years and years of this phone, I bought its successor, the Palm Treo 700P in Summer 2006 on Verizon. Again, pricey! BOTH of these phones have been terrific, and the name “Treo-man” has been applied to me and my superhero abilities using these smartphones. I knew from early on that smartphones would change the nature of computing and work. What the Treos have had right from the beginning is: responsiveness, qwerty keyboard and support for one-handed use. What they have lacked is: a decent camera, wifi, an attractive UI and capacity to hold lots of music/apps. The Treos really helped to start the smartphone landscape, and the current leader, iPhone owes a lot to their design: touchscreen, and open applications. Unfortunately, the Palm company has been unable to innovate as quickly as RIM and Apple. They were overtaken and surpassed over the last few years. Saturday, however, may have marked a new beginning for Palm. The MUCH-anticipated Pre reminds me of the best of Palm’s creativity- new form factor, nice keyboard, great display and best of all WebOS. The new Palm OS promises integration of a lot of the tools I already use. There is no doubt it is cool. I wanted it, badly, and my contract with Verizon is up. But, there is a problem- Palm has made an exclusive agreement with Sprint to sell this phone. Because it runs CDMA, it could potentially only work under Sprint and Verizon. The rumors suggest it may be out on Verizon late, late this year and/or a simpler candybar version (Eos) on GSM networks (AT&T, etc) coming out later this year. Sprint was never my favorite back in the day, and the thought of returning was not attractive, but I still considered it. And then there is the fact that I am part of a family, and soon all the contracts will be up. Staying with Verizon would be fine (and I like the early renewal options) BUT the choice of phones is much much worse than AT&T. The fam simply could not find good alternatives to stay with Verizon, and honestly neither could I! I could downgrade/lateral move to the Palm Centro. I considered lots of different Blackberries, but I don’t care for their user interface (especially moving the cursor). In the end, I discovered that AT&T offers the same discount for me as Verizon, so I took a look and found MUCH better choices not only for me but for the whole family. Now, I could choose the Nokia E71X, or even the N97. But I looked and looked and read and researched (thanks engadget.com especially). I almost bought an iPhone 3G last week (HUGE POTENTIAL MISTAKE!) after asking lots of friends about theirs. Yesterday, I watched the liveblog of the Apple WWDC, and I was sold on the iPhone 3GS with iPhone OS 3.0. It definitely will lead the pack in terms of hardware, and the applications are unrivaled. The interface I will just get used to like the millions of others. My conclusion has been echoed all over the place: The Best Smart Phone Today is Apple iPhone 3GS. 12:10am Bookmarked a link on Delicious. 4:08am Bookmarked a link on Delicious. 7:16am Bookmarked a link on Delicious. 5:57am Bookmarked a link on Delicious.